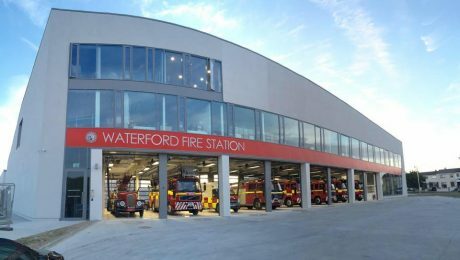 Archive from category "General Blog"
Brief Waterford Fire station history. That in view of the recent disastrous fire in the City and the great want felt for a proper Fire Brigade, the Council approach the different Fire Insurance Companies with a view to inducing them to consent to make an annual contribution, pro rata, towards the maintenance and equipment of an efficient Fire Brigade. At a meeting on 7th July 1903, 4 men, from a list of 9 submitted by the Fire Brigade Committee, were ELECTED as Firemen subject to them passing a medical exam. At a meeting on 1st December 1903 it was agreed that the sum of £528 14s 8d be borrowed from The National Bank at 4% per annum interest “…in connection with the building of the new Fire Brigade Station…”. The loan was to be paid back over 40 years. 7th June 1904 Mr. P Costen’s tender for the building of the Fire Station was accepted. Today we have 32 full time firefighters and 14 retained firefighters protecting the city and surrounding counties 24/7. 2013 – 2015 Fire station rebuild project. 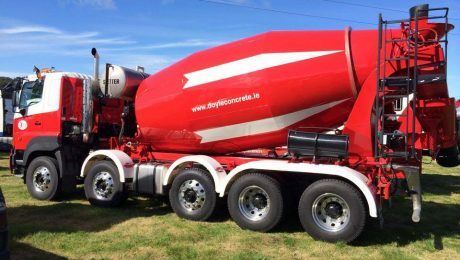 Duggan Brothers were the construction contractor on the project and Doyle Concrete was main supplier of concrete, mainly because having in concrete pump truck on stock, which was putting us in an advantage over our competitors. We have started working on the project on 26/09/2013 and finished on 15/05/2015. 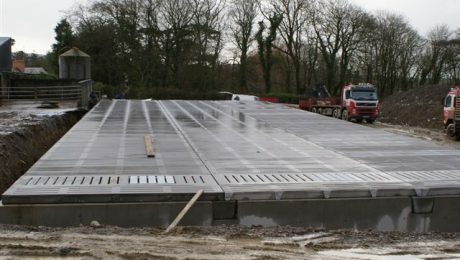 The Fire station was a very large project and 90% of concrete has came from our Waterford branch. On busy days we delivered concrete also from our Hugginstown branch to fulfil construction needs and keep project scope accurate. This build with historical significance was one the largest project we have dealt with. We are glad to leave our landmark in Waterford City. On the picture below you can see Dennis Doyle protesting together with fellow truckers against the enormous road tax comparably to the tax amount in UK. 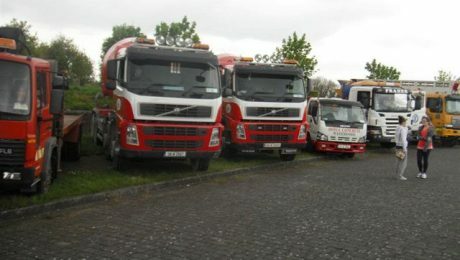 The Irish Road Haulage Association is threatening more strikes across the country unless the Government takes urgent action to address the road tax system. Lorry drivers held a four-hour blockade at Dublin Port this morning causing traffic disruption across the city. 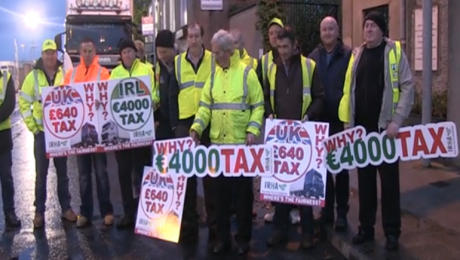 Around 100 members of the IRHA were protesting over the road tax they pay. It costs €4,000 to tax every six-axle truck in Ireland, compared to £640 (€823) in Northern Ireland. The hauliers were also protesting over a tax of £10 on every truck entering the UK. Minister for Transport Paschal Donohoe has reiterated his position that he will meet with hauliers only after they lift the threat of strike action. Speaking on RTÉ’s Six One News, Mr Donohoe said a working group is in place to examine the issue surrounding the disparity in road tax costs between the UK and Ireland. He said he accepts it is an issue of “legitimate concern” for drivers. However, the IRHA said it is “concerned with the complete lack of evidence that this group has made any progress on the matter”. The association said 50,000 people are employed in the haulage sector and these jobs will be at risk if things do not change. IRHA President Eoin Galvin said: “Operators, where possible, are ‘reflagging’ to other jurisdictions to avoid the excessive road tax levels, but that is not an option for everyone. And, quite frankly, why should an indigenous haulage operator be forced to relocate because the Government departments are doing nothing to alleviate this difficulty”. It said today’s action was the first phase of its efforts to reduce the commercial vehicle road tax and called for an urgent meeting with Minister Donohoe and Minister for Finance Michael Noonan on the issue. 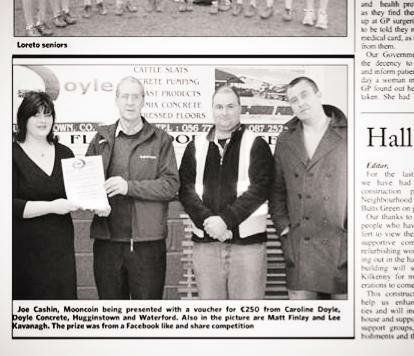 Doyle Concrete are very Proud to take Part in the 2014 Waterford Truck and Motor Show. We had 5 trucks on Display at the show which went down a treat with young and old. Our Pump Truck looked very impressive with its pump extended into the Sky. 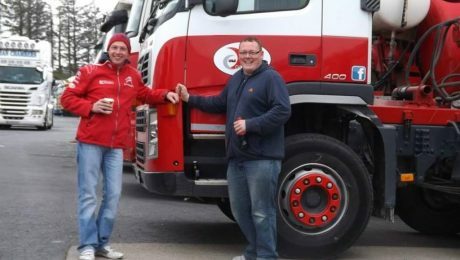 Our Two Waterford Drivers stayed the two nights to mind the trucks. As you can see from the photos they forget to bring home two of the trucks on the Sunday just so they could the Monday morning off to collect them. 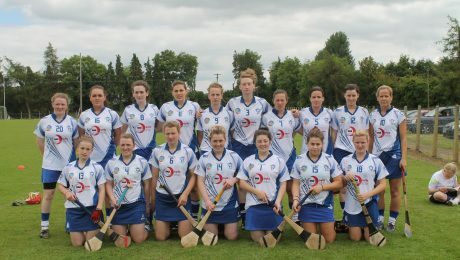 On the photograph above you can see a Waterford Camogie Intermediate Team proudly wearing Doyle Concrete Jerseys. 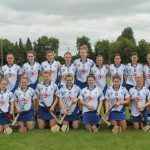 Last Sunday – 21 June 2014 – the team outed against Meath in their first championship and we are proud to announce that they have returned as winners. 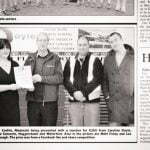 Doyle Concrete is always happy to support sport leagues and emphasise importance of supporting local community. Good luck to our champions! Visit our new blog to find out more about all types of concrete services and products. 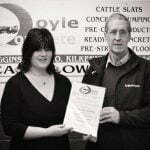 We will cover here recent news and projects completed by Doyle Concrete and you will be able to find here valuable tips and advice on how to correctly work using our concrete products. For example how to apply paving to your driveway or back-garden, how to use decorative stone to beautify your garden. You can also subscribe to our newsletter in order to receive monthly updates directly to your email address. If you have any suggestions use the form below to submit a comment. We have been running competitions on our Facebook business page and we are pleased to let you know that a lot of our followers have shown interest in them. 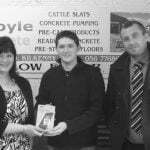 Our first competition prize was a €250 voucher to be used for readymix concrete, concrete products or decorative stone. Mr. Joe Cashin was a lucky winner and he has from our premises in Waterford. Later on the story was covered in the local newspaper. Our second competition offered a different prize, which in this case was a brand new Samsung Galaxy Tab 3. This time the winner was Shane Morrissey who collected his prize on the 10th of May. Follow our Facebook page for a chance to join any of our future competitions. Ready-mix concrete is concrete that is manufactured in a factory or batching plant, according to a set recipe, and then delivered to a work site, by truck mounted in–transit mixers. This results in a precise mixture, allowing specialty concrete mixtures to be developed and implemented on construction sites. The first ready-mix factory was built in the 1930s, but the industry did not begin to expand significantly until the 1980s, and it has continued to grow since then. 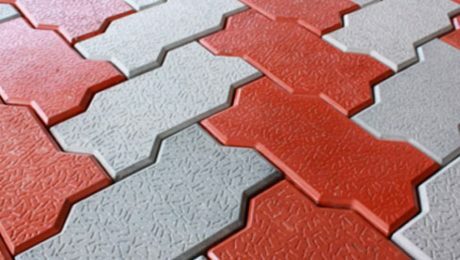 Ready Mixed Concrete is also referred as the customised concrete products for commercial purpose. Doyle Concrete offers different concrete according to user’s mix design or industrial standard. Ready Mixed Concrete, or RMC as it is popularly called, refers to concrete that is specifically manufactured for delivery to the customer’s construction site in a freshly mixed and plastic or unhardened state. Concrete itself is a mixture of cement, water and aggregates comprising sand and gravel or crushed stone. In traditional work sites, each of these materials is procured separately and mixed in specified proportions at site to make concrete. Ready Mixed Concrete is bought and sold by volume – usually expressed in cubic meters. Concrete is a composite construction material made primarily with aggregate, cement, and water. There are many formulations of concrete, which provide varied properties, and concrete is the most used man-made product in the world. Concrete is widely used for making architectural structures, foundations, brick/block walls, pavements, bridges/overpasses, motorways/roads, runways, parking structures, dams, pools/reservoirs, pipes, footings for gates, fences and poles and even boats. Famous concrete structures include the Burj Khalifa (world’s tallest building), Hoover Dam, the Panama Canal and the Roman Pantheon. Concrete technology was known by the Ancient Romans and was widely used within the Roman Empire—the Colosseum is largely built of concrete. After the Empire passed, use of concrete became scarce until the technology was re-pioneered in the mid-18th century. The environmental impact of concrete is a complex mixture of not entirely negative effects; while concrete is a major contributor to greenhouse gas emissions, recycling of concrete is increasingly common. Structures made of concrete can have a long service life. As concrete has a high thermal mass and very low permeability, it can be used for energy efficient housing. In need of some concrete services but not sure of the different options available for the project you have? Whether you require a spiral staircase or you are fitting a swimming pool, there is a concrete service right for you. Read on to find out the different types of concrete services and which suit different projects. Ready mix concrete – Ready mixed concrete is the most popular concrete service and refers to concrete that is mixed at a central plant as opposed to on the job site. The concrete is tailored to the specifics of each job and is usually delivered in plastic condition in cement mixers. Easy flow concrete mix – Flowing concrete contains more water so it literally flows easily onto each site. It is incredible strong and can take foot traffic within 36 hours. It requires minimal labour and work with levelling and compaction. Precast concrete products – Precast concrete is produced off site in a controlled environment, into a specific mould or form. 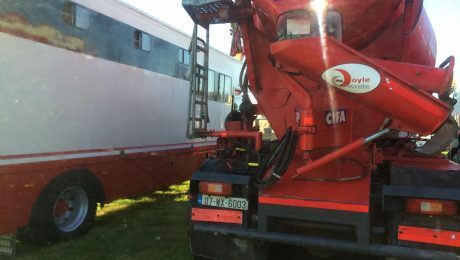 It is then transported to the construction site and lifted into place. This is best for projects that require appearance matches with the surrounding stone or rock. Concrete pumping service – There are two types of concrete pumps used for transferring concrete by pumping. The first pump is attached to the truck and the other is mounted to a truck or trailer. The pump attached to the truck has a remote controlled robotic arm called a boom that accurately pumps the concrete into place. The mounted pumps are also known as line pumps and require flexible hoses to be attached to the outlet of the machine to help lead the concrete. Boom pumps are better for larger, high volume projects and the line pumps are more ideal for smaller projects such as swimming pools and pavements. Conveyor/extendable chutes – Conveyors and extendable chutes can be used to fill those hard to reach places. Ideal for those using ready mix concrete, the conveyor is great for filling high walls and the extendable chute is mainly used for underground jobs, such as house foundations. Prestressed cattle slats – Cattle slats are used for the housing of livestock and the slats are manufactured at a central plant and distributed accordingly. The slats usually come in various sizes with a quality finish. Sand and gravel – Sand and gravel are among some of the original construction materials and have been used for a long time to fill building foundations, runways, motorways, dams and many more applications. Both sand and gravel are used in the manufacture of concrete, making up parts of the aggregate portion of concrete. 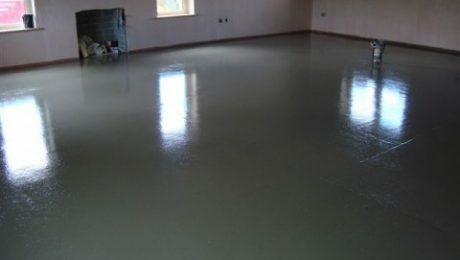 Prestressed flooring – Prestressed floors are best used when a large span and shallow depth are required for a project. They are the most economical span to depth ration and designed to suit the particular needs of each development. Great for producing beams, floors and bridges. Concrete stairs – A variety of different types of stairs can be formed from simple steps to curves, spirals and helicals. Skid mounted and rail mounted pumps – These are not used regularly and usually only on specialised jobs such as tunnels and mines.